I have an exact moment in mind. It was about seven years ago in Guangzhou. I was crossing the vast sand colored, cement patio surrounded by the towering sand colored, cement Oakwood apartment buildings, walking from the little import shop, David's Deli, of which I was an at least once a day visitor, returning to our apartment, carrying some last minute dinner ingredients. I was expecting Caitlin, our seventh baby, and must have been particularly exhausted, because I thought to myself, this is the last time I am doing this. At that moment I heard a boy call out in a loud, extended as if multi-syllabic manner, "Mom!" It seemed like an elementary school boy standing on one of the balconies in the tower across the patio. It was more likely some child from the consulate, than an angelic visitor..but as the sound echoed around that fishbowl of concrete, it moved through the Guangzhou air, thick and grey at dusk, and was carried by a little wind as it travelled through the palmettos, to the extent that it created a moment that gave me the impression that the boy's call was not a coincidence. So, I was not surprised when our eighth child was a boy. We found out from an obstetrician in Quito, Ecuador. She said with a thick Spanish accent, "He is a boy, or I will cut off my head." I thought that hardly seemed necessary either way. Grant's first nickname came by way of our friendship with our neighborhood watchman. I've forgotten the term for non-embassy owned housing in the state department, ( I even forgot the name of David's Deli, until it came back to me after an hour of pondering.) But whatever the real term was, isolation would have also worked, if you'd asked me. The neighborhood guards were my only friends on the street, so from time to time I would stand in the driveway and chat a while. It's possible that they both told me their life stories, but only one had Spanish that I could understand. His name was Segundo. I was fascinated with the numerical nature of his name. He was a large, portly, sweet man, often dressed in t-shirts with leftist political slogans. He was troubled because his pregnant wife couldn't stand him anymore. I told him to chalk it up to pregnancy hormones. I think. Now I'm not sure my Spanish was capable of navigating that discussion at all. In any case, his baby was born. They were happy together, as I knew they would be. We gave him Caitlin's old crib, and nicknamed our still germinating little one Ocho. Sometimes I forget that that name stuck with him up until the time he was born. My Dad was hoping we would Shakespeare-ize it and call him Octavius. I was preoccupied with wanting him to born in September, to the point that I grew increasingly depressed as the month waned. (Pregnancy hormones.) And on September thirtieth I walked three miles around the park, came home just in time to see little Caitlin, who had been napping, fall into a febrile seizure, ran in a panic to the hospital, (strep throat), came home and went to bed still pregnant, defeated, exhausted, hoping to never have to give birth at all, only to wake up two hours later in labor. Five years later, I know that everything about Grant is October. "I love Halloween!" He sang out over and over again into the night on his first Halloween back in the states. He is pumpkins and pirates. He is costumed characters and chocolate candy. He is the number eight. But even back in the hospital room, at two in the morning, I looked up at the white board where the nurse had written October, and understood its perfection. Just one of many times I had to admit to God, You were right, I was wrong. Monday morning Grant requested bacon and Reeses' puffs, for which there was a high approval among the siblings. I took doughnuts into his preschool classroom. We had lunch with Grandma Martha at McDonald's, a tradition for Grant. 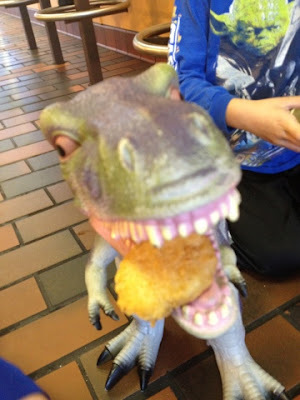 William's dinosaur, unsurprisingly named, Dinosaury, came with us. This seemed as if it were peculiar to the other customers. Grandma Martha and the eleven of us went to Chuck E. Cheese in the evening. It was Sophie's first time to be an active participant. and some of us looked a bit overgrown. As usual, we went home for the late night, maniacal present opening. Everyone was excited about The Avengers. This was Grant's first big Lego set, Batman and the Joker. Happy Birthday Grant. I love you.